This article will discuss what floaters are, what causes them and when you should seek medical advice. It’ll also cover some frequently asked questions and various treatments that can be used to remove floaters from your field of vision. Floaters occur when people see small shapes floating in their vision. They can be a variety of sizes and shapes and may look like long, narrow strands; large spots that are cloud-like; small, shadowy dots or tiny black dots. These float across your eyes as you look at something, often darting across your vision as you move your eyes around. However, they don’t directly follow your eye movements, and if you try to look at the floater(s), it’ll often seem like they’re darting away. And, when your eyes stop moving, you’ll probably find that they seem to drift away from your vision. Floaters are incredibly common, which means a lot of people suffer from them and eventually learn to ignore them. Some might not notice they have them until they become more prominent or numerous, and you may only notice that they’re there when you’re looking at something bright, e.g. a blue sky or a piece of white paper. Floaters are located in the eye’s vitreous humour (the gel-like part of the eye that helps to keep it in shape) and are small pieces of debris that will float around. They’re found in front of the retina (the light-sensitive surface at the back of the eye) but behind the lens (the clear structure that helps to focus light when it enters the eye). The vitreous humour makes up 80% of the eye and fills the middle space of the eyeball. 99% of this is made up by water with the other 1% being various substances that help to retain the round shape of the eye. The risk of developing floaters increases the older you get with most occurring in people who are aged 40 and over. However, they’re even more common in those aged 60+. Some younger people can also develop floaters in their vision. Softening of the vitreous humour can occur as you get older, which means that strands of collagen (a protein) can start to become visible. It is these strands that appear as swirls of floaters when you move your eyes around. And because light travels through this clear vitreous humour before it reaches the retina, these strands can cast shadows on the retina, which will then be transmitted to your brain via the eye’s optic nerve. PVD is something that occurs in approximately 75% of people who are aged 65 and over, and floaters can be a common symptom of this condition. This is due to how the vitreous humour changes as people get older. As the eyes change with age, the vitreous humour can become more liquefied in the centre, with the outer (the cortex) shrinking away from the retina. Because this outer part contains more collagen, the collagen can start to clump together and thicken, which can result in floaters appearing in your vision. In about 50% of people, the vitreous humour has come away from the retina by the time they reach the age of 50. In most cases, this won’t cause any problems and you might not be aware that this has happened. However, in some cases of PVD, the vitreous humour can actually pull on the retina, which can cause some of the retina’s tiny blood vessels to burst. These may then bleed into the vitreous humour with the red blood cells appearing like smoke or tiny black dots in your vision. Over a few months, these floaters should start to disappear as the blood’s re-absorbed back into the retina. In other cases, the vitreous humour can remain attached to certain areas of the retina, which means that the retina gets torn as it starts to pull away. If this happens, blood that seeps into the vitreous humour can create a number of floaters that appear suddenly and you may also notice flashes of light across your vision. If you do notice these symptoms, you should have your eyes examined as soon as you can, because if left untreated, retinal tears can result in retinal detachment. Even though retinal detachment is rare, it’s incredibly serious and can result in visual impairment or full vision loss. Retinal detachment affects approximately 1 in every 10,000 people each year and is caused by the retina coming away from the back of the eye. Because of the important role the retina plays in transmitting images to the brain, if it becomes damaged, it can mean that the images the brain receives are patchy or completely blank. It’s very rare that floaters indicate retinal detachment but a large number of floaters is one of the symptoms of this condition. If you experience these along with flashing, bright lights or a loss of vision, you should contact your doctor or optician immediately. If you have eye surgery, such as a procedure to remove cataracts, you’re more likely to find floaters appearing in your vision. In other cases, floaters can be as a result of infection, uveitis, eye disease or an eye injury. You’re also more likely to suffer from floaters if you are short-sighted (where things in the distance are blurred) or you have diabetes. You might not notice your floaters all of the time but may see them drift slowly across your vision when you’re gazing at something. They’re usually semi-transparent or grey and when you’re looking in different directions, it may seem like they’re moving really quickly across your eyes. Floaters are known to appear as cobwebs, lines, circles or dots as well as many other shapes, and you can either have a lot of small ones or several larger ones. Most will be small and will soon move out of your field of vision when you focus and look at something else. If you are suffering from larger floaters, you may find activities that require a lot of concentration become difficult, e.g. driving or reading. When Should You Visit an Optician? Floaters are common and most of them are harmless, causing little or no effect on your vision. However, eye checks every two years are highly recommended, even if you don’t feel as though anything is wrong. If you do find that a new floater has suddenly appeared, you should visit your optician straight away. This is also the case if the number of floaters you have increases suddenly. Sometimes, your optician may refer you to see a specialist who can diagnose and treat eye conditions (an ophthalmologist). As mentioned previously, floaters can be a symptom of retinal detachment or retinal tears. An ophthalmologist will check for these by looking at your retina. But if your retina has become detached, you’ll probably be experiencing a larger number of floaters than usual; flashing, bright lights and some vision loss. If you are experiencing any of these symptoms, seek emergency medical attention from an optician or your GP. Even if floaters aren’t affecting your vision, you should tell your optician about them when you visit them for your routine eye check. The optician may then ask how long you’ve had them for and what medical history you have with your eyes, e.g. if you’ve ever had any eye surgery or if your eye has been injured in the past. If your optician refers you to see an ophthalmologist, they’ll take a closer look at your retina by looking through your pupil (the black hole at the front of your eye that controls how much light enters it). Sometimes, the surgeon will need to get a clearer view, so they may use dilation to make your pupil wider. This involves placing eye drops in your eye to widen the pupil fully so they can examine the entire retina with ease. They may also use a slit lamp, which is a medical instrument ophthalmologists use to examine eyes. This has a bright light and a lens, which will enable them to look at the interior of your eye. You may find that after the examination is over, you have blurred vision and your eyes are more sensitive to light for several hours after. However, this test is crucial when trying to diagnose the cause of the problem and will help the ophthalmologist to determine whether there are any underlying conditions that need treating, e.g. retinal tears or detachment. If the ophthalmologist feels as though they need to look into your eye symptoms further, they may also perform a few other tests. These can include asking you to look in various directions, examining your retina in more detail with a bright light or pushing on your eye using a specialist instrument. During an eye pressure test, the pressure inside your eye will be measured using a special instrument (tonometer). A small amount of dye and anaesthetic will be put onto your cornea (the eye’s front cover) during this test. The tonometer then emits a blue light which is held against your eye to measure its pressure. If the ophthalmologist finds that the pressure in your eye has decreased, this could be an indication of retinal detachment. How Can Floaters Be Treated? In most cases, floaters are just annoying and won’t require any medical treatment. Most types of medication, including eye drops, won’t work and will not remove the floaters from your field of vision. Furthermore, you may find that your brain, over time, starts to ignore these floaters so you don’t notice them as much. But if you do find that one appears in the middle of your vision, try looking up and down, as this may help to move it from your vision. This is because the vitreous humour will move around and this may help to shift the floater to another area of your vision that’s not as noticeable. When treatment is required for floaters YAG Laser treatment (Viterolysis) can be used to break them and move them towards the edges of your eye (there are several clinics in the UK and some in Europe like this one in Amsterdam that carry out this treatment). If floaters are having a significant negative effect on your eye sight then a type of surgery called a vitrectomy may be recommended. This treatment involves replacing the gel-like liquid in your eye with a saline solution but it’s not often carried out as it can be quite invasive. 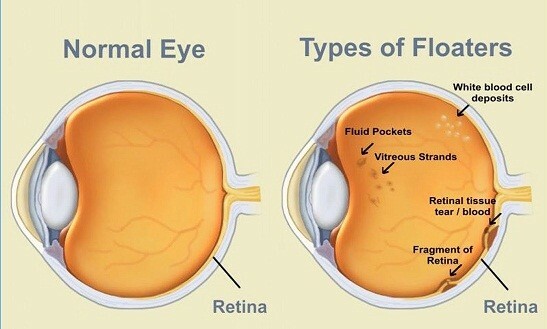 If you’ve got floaters, you may be asked to return for a follow-up appointment by your optician (around 2 to 6 months after you’ve initially noticed them) so they can check that your retina’s still stable. However, if the floaters aren’t getting any worse and they’re not affecting your vision, you may be advised to book an appointment with your optician every 1 to 2 years. Should your symptoms worsen at any point, you should seek immediate medical advice from your optician or GP. A vitrectomy involves surgery where your vitreous humour and all of the debris that’s causing your floaters is removed before being replaced with a saline (salty) solution. This treatment is normally recommended when you have a number of floaters that haven’t got better over time, or if your vision is being significantly affected by them. That said, vitrectomies are rarely performed because of the risks involved and it may not be a procedure that’s readily available through the NHS. However, if a vitrectomy is performed on your eye, it will be numbed first by a local anaesthetic. Then, the vitreous humour will be removed from your eye and the surgeon will replace it with a saline solution. Because most of the vitreous humour consists of water, you’ll not notice the difference once the surgery has been carried out. But the potential complications afterwards include retinal detachment, retinal tears and cataracts. As you can see, floaters are incredibly common, and, in most cases, they’re nothing to worry about. However, if you do notice one in your vision for the first time or more start to appear, it’s worth getting the advice of your optician straight away, just to put your mind at rest that it isn’t anything more serious.